Essential Fatty Acids (EFAs), specifically omega-3 fatty acids, can help to improve heart health, fight autoimmune diseases such as rheumatoid arthritis and lupus, and aid in cancer prevention. Essential fatty acids must be consumed in food or taken as supplements because the human body cannot make them. Omega-3 fatty acids include docosahexaenoic acid (DHA) and eicosapentaenoic acid (EPA). Dietary sources of omega-3 fatty acids include fish oil and certain plant/nut oils (flaxseed and walnut). Omega-6 fatty acids are another form of essential fatty acid found in corn, soy, canola, safflower and sunflower oil. While necessary, the average American consumes 10 times more omega-6 fatty acids than the body needs. Because omega-6 and omega-3 fatty acids compete with each other to be converted to active metabolites in the body, it is beneficial to either decrease intake of omega-6 fatty acids, or increase omega-3 fatty acids. The American Heart Association recommends eating fish at least two times per week. In particular, fatty fish are recommended, such as anchovies, bluefish, carp, catfish, halibut, herring, lake trout, mackerel, pompano, salmon, striped sea bass, tuna (albacore) and whitefish. The source of the fish is important due to the potential presence of toxins such as methylmercury, and caution is warranted in young children and pregnant/breastfeeding women. Even people who eat fish several times a week often aren’t getting enough EFAs because much of the fish consumed today are farm-raised and fed a diet of grains instead of fish meal and therefore their oils lack significant amounts of EPA and DHA. Also, there are several factors that can lead to a reduced absorption of EFAs: age, poor diet, alcohol consumption, low levels of certain vitamins and minerals, some prescription drugs, compromised immune status and a diet high in trans-fatty acids. There is evidence that supplementing EPA and DHA in the form of dietary fish or fish oil supplements lowers triglycerides, reduces the risk of death, heart attack, dangerous abnormal heart rhythms and strokes in people with known cardiovascular disease, slows the buildup of atherosclerotic plaques (”hardening of the arteries”) and lowers blood pressure slightly. Multiple randomized controlled trials report improvements in morning stiffness and joint tenderness with the regular intake of fish oil supplements for up to three months. Benefits have been reported as additive when fish oils are taken with anti-inflammatory medications such as NSAIDs (like ibuprofen). 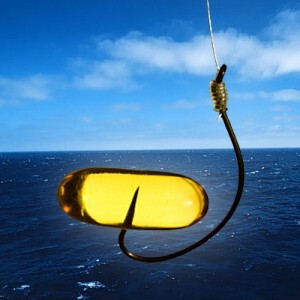 The U.S. Food and Drug Administration classifies intake of supplements containing up to 3 grams per day of omega-3 fatty acids from fish as GRAS (Generally Regarded As Safe). Caution may be warranted, however, in diabetic patients due to potential (albeit unlikely) increases in blood sugar levels, patients at risk of bleeding, or in those with high levels of low-density lipoprotein (LDL). Gastrointestinal upset and fishy aftertaste may occur with the use of fish oil supplements, but can be minimized with the use of a quality supplement, and taking with meals, starting low and gradually increasing. 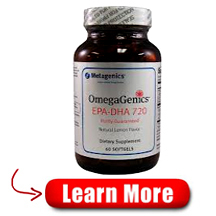 OmegaGenics EPA-DHA 720 offers a quality guarantee, backed by extensive testing by one the top independent labs in the world.